‘Hiking and Pack-rafting Tasmania; North to South’ sounds pretty simple on paper. What ensued was anything but. It was however an incredible adventure. After a year of dreaming, months of planning and a couple of days flying from my home in London I was in the tiny town of Penguin on the North coast of Tassie in my childhood home of Tasmania. I waved goodbye to a new friend and as soon as my boots hit the road they were moving away from the beach and in search of the great rugged wilderness of Tasmania. The first 5 days would be spent along the Penguin to Cradle Trail. This is a hike along a rather dilapidated path, mostly due to the fact that 8 months previously a vicious storm ripped through Tasmania uprooting trees and causing the path to be… well… not so much of a path at points but a mere guide. Still, I’ve always taken the path less travelled in life so having to hike out a hundred metres and come back to the starting spot because it’s the wrong way and repeating 4 or 5 times a go became the norm. Along this hike I’d summited Black Bluff and had a horrible case of dehydration and altitude sickness, in large part because of the previous day’s exertion in which I’d pushed on for some 46 kilometers. This left me hacking through the hilltops heading from Black Bluff and making a line for Cradle Mountain. Enduring a storm and puking my guts up at one point, I took rest inside my tent and listened the beating of the rain and howling of the winds; which was actually rather peaceful when I was in my sleeping bag. Eventually I reached the base of Cradle Mountain and on a foggy morning, this time full of energy, I bounded up and over the boulders that were wedged together to form the top of the mountain. I absolutely loved leaping up and up and eventually reaching the summit and pausing to gaze out upon the rolling hills and lush greenery Tasmania offers. After Cradle Mountain came the world famous Overland Track where I saw a number of wallabies, bandicoots and possums. I even heard a rarely seen Tasmanian Devil scurrying around outside my tent! Hiking along these trails I made great ground covering a marathon a day for 3 days, to reach Australia’s deepest lake, Lake St Clair, at 165 metres deep. This meant I could use my inflatable pack-raft that I’d been carrying in my backpack. Being completely self-sufficient, I’d been carrying 35kg of gear including my dehydrated food, tent, pack-raft and paddle amongst other things. I pumped up the pack-raft and jumped in, paddling the lake and enjoying the freedom of the waters. 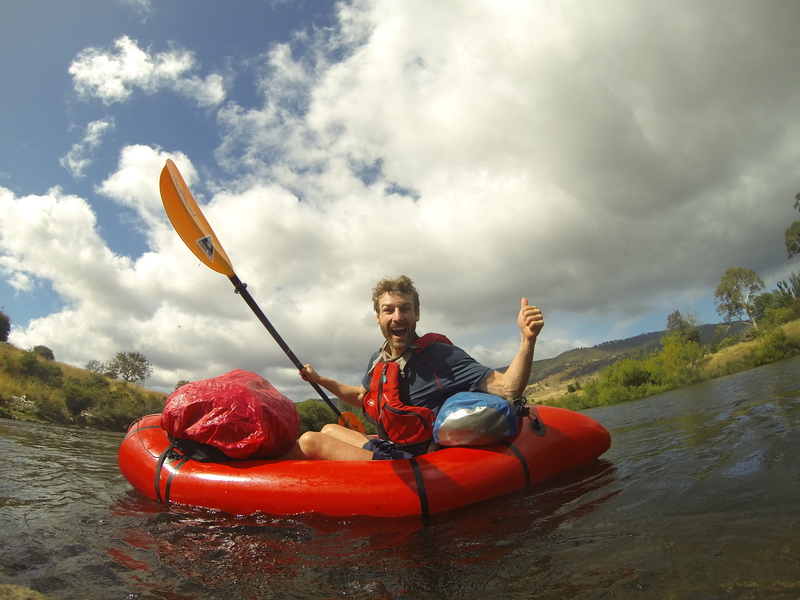 Eventually I reached the beginning of the Derwent River and a few days later, after battling strong winds on Lake King William, I made it to the end of the water and packed up once more. It was time to hike and find the source of the Gordon River. What happened next really set the tone for the rest of the adventure. The forest became thick, the thickest I’d ever encountered, and I was scrambling up and over fallen trees, crawling on my hands and knees and simply kicking and breaking the bush in order to get through this dense land. I was moving at a rate of 1km an hour. After a few hours of crawling along I stood up next to a white-lipped snake! We eye-balled each other, and thankfully the snake slithered off. A few minutes later I made it to an open field and took pause for breath. I pulled leaches from my toes and hands and licked my wounds both metaphorically and literally. The Gordon River was dry which meant I had to hike alongside it and wait for the intersecting rivers to raise the water speed and levels. With each joining river I became more and more worried because the water was not rising and the further downstream I travelled the more logs and fallen trees seemed to build up in the river meaning I couldn’t put my pack-raft in. I spent 5 days hacking my way through the bush along the side of the river and actually hiking in the river itself as it was quicker at points. I’d been going some 15km per day but only making it 10km downstream by this point. On one of the many climbs over a fallen tree I slipped on the wet moss and landed awkwardly on my left knee causing my heavy bag to lean one way and my knee joint the other. A popping sound made me take pause for a moment before putting it out of my mind and continuing on despite the pain. [Later it was discovered that I’d torn my knee ligament and the meniscus in between the joint]. Being in the middle of the wild with no one else but myself to rely on I put this out of my mind by wrapping a bungee cord around my waist and poking both the hooks into my hip bone, forcing my mind to think of this pain rather than my knee joint which was now swollen and grating. I found a couple of walking poles and used them like an old man. I pushed on for one more day hoping desperately that the Gordon River would raise its water level with the joining of a lake. This was not to be though so I had to make a decision to continue along the river in the hope it would allow me on it in a few days’ time. It could be another week to walk alongside it plus another 3 days hike out to safety, but I would have a water supply. Or I could hike out away from the river and up and over a couple of mountains in search of a small road. Stick or twist time as I called it. I twisted and hiked up and over the mountains, sleeping on the edge of one and getting caught in even thicker bush than previously. I didn’t think about anything other than the next step, just focused on the present moment and on trying to survive at this point. 2 days later upon reaching the road I knelt down and kissed the bugger with all my heart. No sooner had I reached the road than my GPS battery died and I was clinging onto my last 300ml of water having hiked half a day on 100ml and a handful of oats. The bush had ripped my clothes and much of my skin to shreds, my knees and arms were scabbed up and my trousers were being held up by a bungee cord on each leg. I memorised my route for the next 100km and took a moment to wash in a running stream, eat lunch and enjoy a coffee. I spent the next 2 days hiking along small paths and roads and passing many echidnas, kookaburras, galahs and even walked past a poisonous copperhead snake as it slithered around on the side of the road. Eventually I made it to the town of Maydena and found a new route paddling down the Derwent River and through its white water course before hiking (more like hobbling at this stage) up and over one final mountain to the Huon River, where I met my Mum and Dad. Dad and I jumped in his canoe and paddled the Huon River though, in keeping with the adventure, we ran aground on some rocks due to a storm and rough weather. When I looked back and Dad was waist deep in water I knew we had to pull in and set up camp. With the tent up and the storm rolling in we sat around our campfire, ate noodles and washed them down with a swig of rum. I enjoyed the calm of this moment just staring at the stars and understanding how insignificant we really are in the universe and yet know that we can each create ripples in our world that can have a far greater effect than I can fathom.